It’s cold. Too cold to contemplate even sticking my nose out of the sleeping bag. Procrastination sets in. Another 5 minutes. Alpine starts. This job’s only evil. We are at 6,300m. 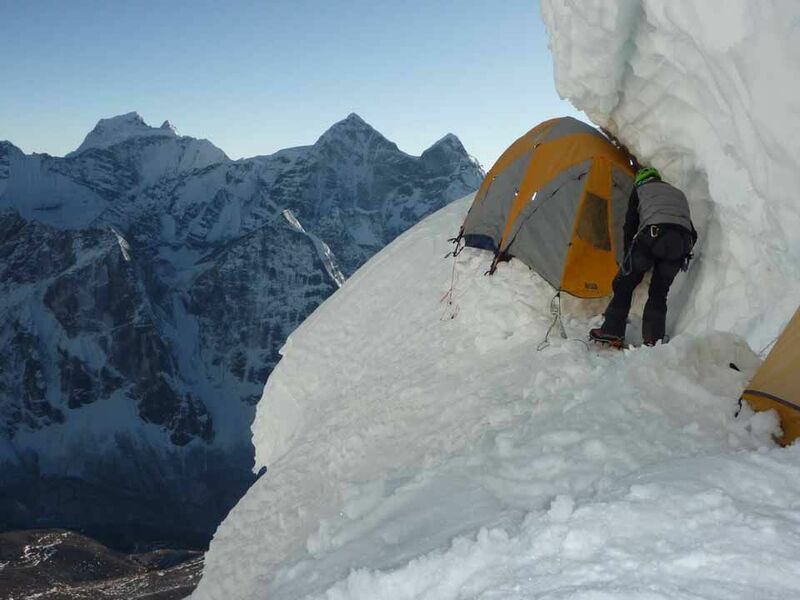 Balanced precariously on an icy ledge called Ama Dablam camp 2.7. In the tent with me is Simon. We can’t pretend to have slept. Both of us have been wide awake listening to the creaking and snapping sounds coming from the large block of ice balanced equally precariously above our already precarious tent. Today there is no flapping. We are already wearing the layers and harnesses. We only have to reach out the tent door to find the plastics. By the time we have struggled out of the tents and become reacquainted with the precarious situation we are camped in the sun has already climbed over the crest of the peaks surrounding us. The bitterness of the weather strikes us immediately… the wind is howling like some deranged animal… our temperature gauges are registering something obscene. Another fine moment on a 6,000m peak in the Himalayas. Another moment that simple words cannot describe… we clip into the fixed ropes and begin the summit attempt.